The people of Bristol seem to be already taking one of our newest branches to their hearts. Cloudy2Clear Bristol, operated by branch manager Graham Bayley is experiencing rapid growth as word begins to spread that if your windows are steamed up, broken or damaged that there’s a local branch ready to help. 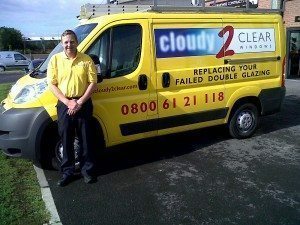 ‘I called Cloudy2Clear as I had a real problem with a window which, I have to say, I kept meaning to do something about but I always thought it would cost a fortune. Graham came out to see me, identified the problem and offered me the solution. Within a matter of days he had replaced the glass in my window and fitted 2 new hinges, all at the very reasonable price he had originally quoted and all with a new guarantee.